What have we achieved so far and how do we improve? Workshop – Held by Angelo and Tsvetan? Comments on articles and fun pages (Eijkhagen College) and preferably everyone else. Comments can be made and discussed within the group. Rick will give an update on what he has done so far. Maybe we can upload everything this week! Decide where the next meeting should be held. Maybe next annual meeting in Kaiseri, because there is a total solar eclipse on 26th December! Pupils will discuss the website which has been made by Rick. Try and include links for other European languages. Who and how will the website be maintained? Any other issues to be discussed. •	Introduction: What has been done so far. •	Instructions on how to upload new articles. This should be done via a log in system. •	Future aims and objectives: Every school or/and pupil can have their own log in system for security. Reasons to be explained. •	Georgolios Nikos - the first encounter with Chemistry at the age of 14. He’ll make a PowerPoint presentation. (e-mail: ngeorgol@otenet.gr). •	Touloumis Cosmas - interested in teaching mathematics from the ancient greek texts, some ideas for a cross-scientific approach of mathematics. He’ll make a PowerPoint presentation (e-mail:ktoul@otenet.gr). •	Friligos Stelios - teaching Physics and Design and Technology. Especially interested in some ideas for a cross-scientific approach of teaching physics and Technology (PowerPoint presentation) (e-mail: sfriligkos@sch.gr). •	Zarfzian Marilena - teaching Biology. All of us invite teachers from the partner schools interested in the above subjects to exchange views with us even before the meeting. What have partners done so far? 3. Organise the EPM meeting 2005. Organized a competition at school. Students wrote an essay about our project topic. 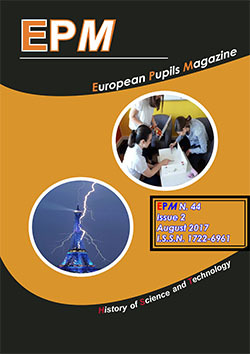 Want to hand the essay that will be chosen as best in the competition to EPM magazine.